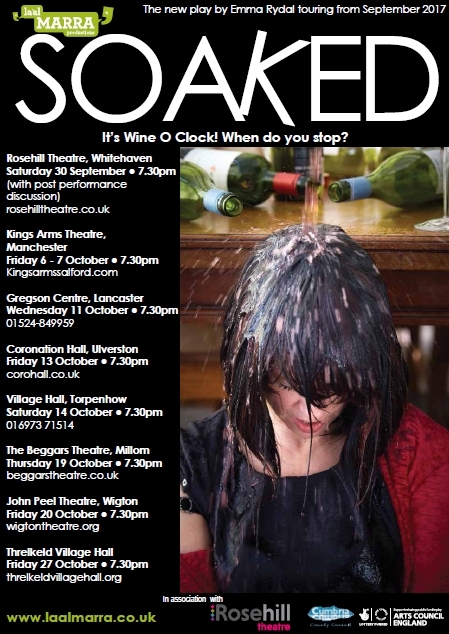 Laal Marra Productions are now producing 'Soaked' in collaboration with The Rosehill Theatre. The project has received funding from The Arts Council and Cumbria County Council and will tour Cumbria, Lancaster and Manchester in October. The show opened at Rosehill Theatre on Saturday 30th September 2017 and toured Cumbria, Lancaster and Manchester in October 2017. Soaked is back in 2018 at The Kirkgate Centre in Cockermouth on 21st July followed by a run in Keswick at The Theatre By The Lake from 6-11 August. For full tour dates, and to book tickets, click here. La'al Marra Productions was formed in 2011 by actress and writer Emma Rydal to create professional theatre and short films. The company uses local talent wherever possible. Rydal's first play 'True' chronicled a mother daughter relationship through the decades. It premiered at Manchester's 24.7 Theatre Festival in 2011 and won The Audience Award for Best Production, The Vicky Allen Equity Award and was nominated for a Manchester Theatre Award. It toured around Cumbria where the company are based. Based on the play a screenplay was written and two short films 'One Last Walk' and 'A Bit More Sleep' were made. The latter winning an Osprey Award at Keswick Film Festival. The company are now producing 'Soaked' in collaboration with The Rosehill Theatre. The project has received funding from The Arts Council and Cumbria County Council and is back for Summer 2018 following a succesful tour of Cumbria, Lancaster and Manchester in October 2017.